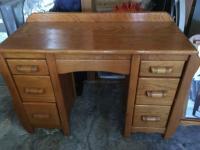 Solid wood desk that could also be used as a dressing table. It is 48 inches wide, 19 inches deep and 31 inches high to desktop from the floor. On each side of the middle area for a chair are three drawers for a total of 6 drawers. Has a dark blond finish. There is a matching separate wood framed mirror 29 inches high and 24 inches wide. Please indicate a day and a time (daylight hours only) when you would like to pick up.